Never Leak RV Roofing is an RV specialist in RV Roof Repair, RV Roof Replacement, and RV remodeling for over 29 years. 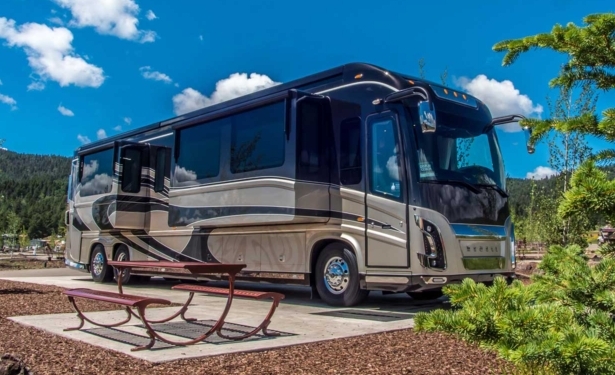 We offer mobile RV services, 20 year RV roof coating, interior RV remodeling, RV flooring repair, RV windows resealed, RV custom cabinets, RV AC Repaired and replaced, and RV interior leak repairs on ceiling and walls. Never Leak RV Roofing can make your troubled RV new again! We offer a FREE INSPECTION service to all our customers because we think safety comes first! Never Leak RV Roofing gets on the RV Roof and inspects it for any RV roofing issues, including RV water damage or RV potential water leaks. Please call to make an appointment 1-888-306-8886. RV LEAK REPAIRS: RV Roofs will get worn over time. Simple RV leaks can be fixed by caulking and patching, but will not be guaranteed. It usually is recommended to re-coat with our Liquid Roof System and when applied after which we offer a 5 year guarantee. We can Fix your RV Leak. RV WATER LEAKS: Never Leak RV Roofing is an expert at finding RV Roof leaks. We fix the damages by removing and then replace the underlayment if necessary. Inspect the RV Roof framing, insulation, wire and interior roof surfaces and replace if necessary. RV RE-ROOF: Your RV Roof is no different than your home roof and there may come a time when you might have to re-roof. Never Leak RV Roofing can replace rotted or damaged plywood and give you a like new roof. 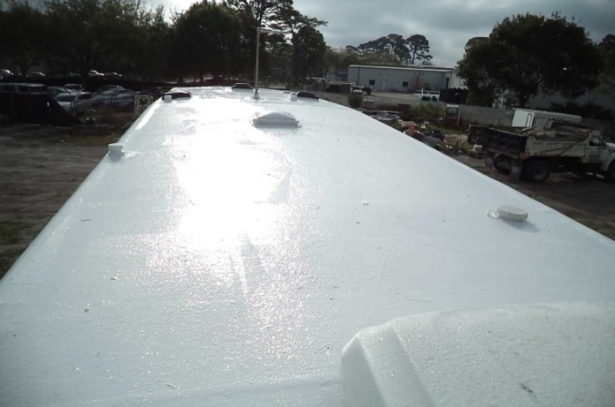 RV NEW RV ROOF: Never Leak RV Roofing can completely replace your RV Roof if necessary. 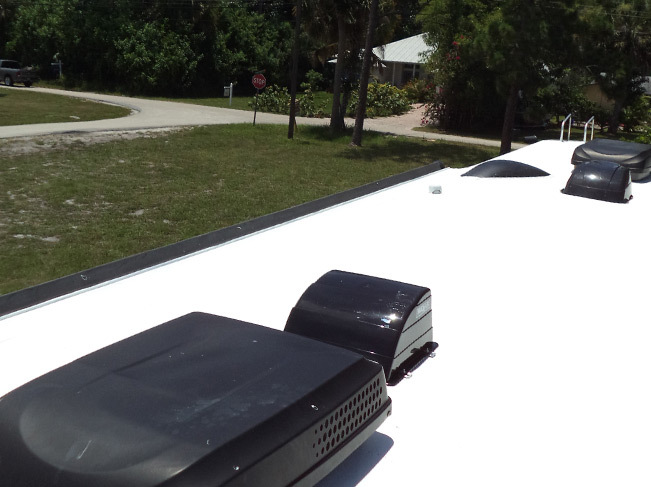 RV ROOF PREVENTIVE PROGRAM: The heat and sun in Florida is brutal on RV’s and Motor Homes. 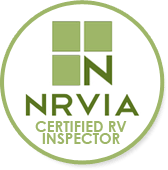 At Never Leak RV Roofing we offer an RV Preventive Maintenance Program. We also provide RV Window Repair, Re-Sealing, A/C Repair, Flooring and more. About 12 to 18 months of buying your brand new RV, Mobile home or Travel Trailer it starts to chalking and streaking. To avoid this your RV should be washed at least 4-6 times a year and inspect your RV for damage and leaks 2 times a year. With regular Maintenance you can minimize chalking and streaking. What we do is wash the roof with a TSP cleaner let the RV and dry check all the seals, air conditioner, vents, caps, sewer vents and around the entire RV roof for cracks and damage. We can re-seal your RV roof if necessary. For all RV repair services - Please call to make an appointment 1-888-306-8886. 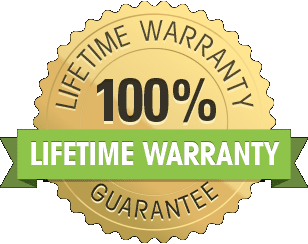 RV Roofing Products and services provided by Never Leak RV Roofing carry the best warranties in the industry and keep your rig looking good. Having a leak in your RV roof can be a frustrating ordeal for any RV owner - not knowing where it comes from can become an even bigger problem. Leaks can cause interior damage to ceilings and walls. A GOOD leak is the one you can find. A BAD leak is the one you can't find. Stopping leaks and preventing them from coming back is our main goal at Never Leak RV Roofing. WHY NEVER LEAK RV ROOFING IS THE BEST CHOICE! Based in Jensen Beach, FL and serving all of Florida.